Revel in your favourite season with the Forever Spring Tulip Mixture. This diverse quartet includes the rosy pink, white rimmed All That Jazz tulip, the lavender Light and Dreamy tulip, the red-eyed, yellow rimmed Hot Honey Rag tulip, and the deep crimson Life's a Cabernet tulip. These hardy perennial tulips bloom all season long and grow to a towering 28 to 30 inches tall. Plant this fabulous foursome in the fall. Tulips wane when exposed to excessive moisture, so make sure to set them in a sunny or partially shady spot with well-drained clay, loamy or sandy soil. 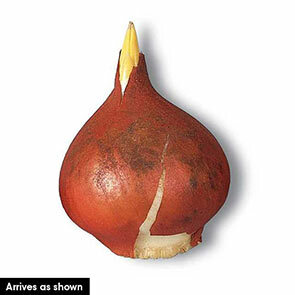 Bury your spring tulip bulbs about 3 inches deep and 4 to 6 inches apart to avoid overcrowding their robust 6-inch blooms. This Dutch-sourced collection thrives in hardiness zones 3 through 8. 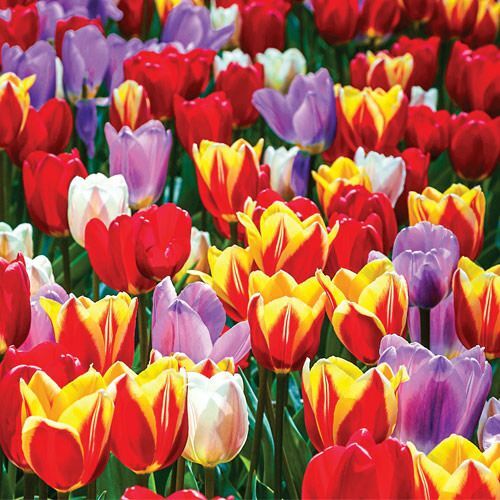 With its long lasting blooms, wide range of hues and sturdy stems, the Forever Spring tulip mixture is a solid addition to your vernal garden. These tulips will appear at the same time as many varieties of daffodils, so consider encircling your spring tulip bulbs with more neutral varieties of white or pink daffodils, or pair this mixture with an equally varied daffodil blend to create an elaborate sensory bounty. Make this spring last a lifetime with the Forever Spring tulip mixture. A well-balanced mix of Forever Spring Tulips. We searched for years to find an extra-long-blooming tulip variety, and feared that we never would...until one grower introduced us to this very special hybrid. We could hardly believe our eyes when we saw just how long these incredible, colourful, 6" blooms last. Our Forever Spring Tulips begin blooming extra early, emerging with your favourite daffodils.